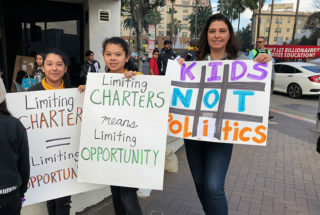 Charter supporters rally Tuesday outside LAUSD headquarters to urge the school board to reject the charter moratorium resolution. 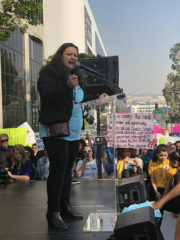 “By supporting this it doesn’t mean that in L.A. we are going to have a moratorium, that’s not what this means,” board President Mónica García explained a day after the vote. “It’s a communication about an intention about what would be helpful from one particular perspective.” Until Gov. 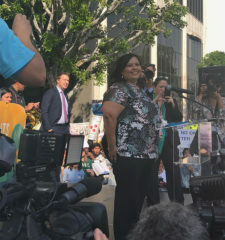 Gavin Newsom acts, nothing has changed in L.A., she said. 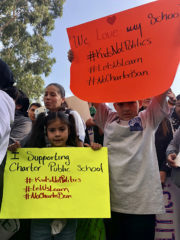 Charter students at the rally. 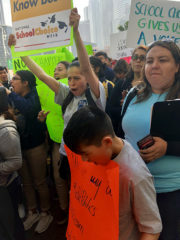 Students at the Tuesday rally. “I grew up in a Communist country where I had no choice for schools, so I want choices for my children. I have nothing against LAUSD. I just want to have a choice for my children. I did have not that in my country, that’s why I’m here,” Carmaz said. 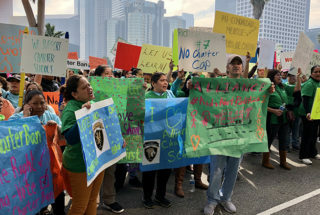 *This article has been updated to correct that Xitlali Castro applied to seven schools for her son, but only four of them were charter.